First off, Sean Swain gives his perspective on gentrification and some recommendations on how to effectively fight that blight. This week on the show William speaks with Amanda and Justin about the No New Animal Lab campaign, which aims to protest the building of a massive animal testing facility on the University of Washington campus at Seattle and to explore the nuances which the animal rights movement in the US is capable of. We speak about Skanska (the company responsible for building the lab), NNAL’s nation wide tour (which just ended a few weeks ago) and about solidarity building with other projects, state repression and how to deal, as well as the condition of the animal rights movement today. 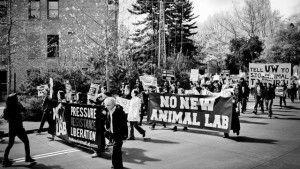 To learn more about this campaign, and for more information on the upcoming demo in New York on January 15-17, you can visit their website at http://nonewanimallab.com/ and click the “take action!” tab. To contact our interviewees for discussions about how you can get involved in this issue, you can shoot them an email at info@nonewanimallab.com, and if you feel in a position to donate to any legal defense you can go to their website and click the “Donate” button. Playlist for this show features Asheville’s own Uninhabitable with a track off their brand new release, and a track from the new Yob album, which will be playing in Asheville at the Mothlight on Tuesday the 10th.